BEND, Ore. – Many millennials lack knowledge about the importance of sunscreen and continue to tan outdoors in part because of low self-esteem and high rates of narcissism that fuel addictive tanning behavior, a new study from Oregon State University-Cascades has found. "This study gives us a clearer understanding of actual consumer behavior," said Watson, an assistant professor of marketing at OSU-Cascades. "The number of people still deliberately exposing their skin to the sun for tanning purposes is alarming. We need to find new ways to entice people to protect their skin, including challenging the ideal of tan skin as a standard of beauty." In an effort to improve consumer education about the role of sunscreen in the prevention of skin cancer, the Centers for Disease Control and the Food and Drug Administration developed a new "Drug Facts" panel of information now required on all sunscreen bottles. The panel includes directions for sunscreen use and advice on other sun protection measures, among other information. The researchers' goal with the study was to gauge whether the information on this new label is effective at curbing tanning behavior and if new information is helping to increase consumer knowledge about how and when to use sunscreen and how much to use. The study participants, 47 percent male and 53 percent female, scored an average of 54 percent on an 11-question sun safety knowledge test, which included true/false statements such as: "On a daily basis I should use at least one ounce of sunscreen on exposed skin" (true); and "When applied correctly, SPF 100 is twice as effective as SPF 50" (false). The participants' levels of tanning addiction were measured through questions such as "I get annoyed when people tell me not to tan," and "I continue to tan knowing that it is bad for me," and "I feel unattractive or anxious to tan if I do not maintain my tan." "What we found is that this knowledge doesn't matter to the consumers," Watson said. "That tactic to require sunscreen manufacturers to include this information is not effective." 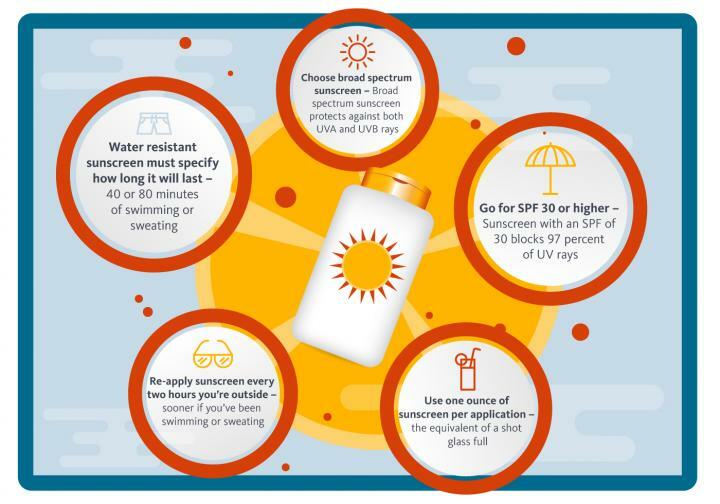 Sun safety and sunscreen messaging from the CDC is all statistics-based, emphasizing the likelihood of a skin cancer occurrence or diagnosis, Watson said. But that type of message isn't resonating with millennials. The next step for Watson and her colleagues is to begin testing other types of messages to identify ways millennials would respond more positively to sun safety measures. "People are starting to get the message about the dangers of using tanning beds, but a large number of people are still tanning outdoors, deliberately exposing their skin to the sun, because they think it's attractive," she said. "We need to move away from the narrative where tan skin is associated with health and youth. That's the opposite of reality. Because reality is tan skin is damaged skin." What can a tasty milkshake teach us about the genetics of heart disease?